Looming over the Town of Canmore, Mt. Lawrence Grassi is more of a difficult hike than a proper mountain scramble. However, if you're able, the climb to Grassi's summit on a clear day provides exceptional views of the town, the Spray Lakes Provincial Park, and many nearby peaks such as the Three Sisters, Ha-Ling Peak and Mt. Rundle. Even better, unlike nearby scrambles such as Ha-Ling Peak and the East End of Rundle (EEOR) that can be crawling with visitors, an ascent of this neighbouring peak can offer actual solitude. For example, I only encountered one other hiker all day when I climbed Grassi on a Saturday, yet managed to capture a dozen hikers near the summit of Ha-Ling Peak in a single photo! 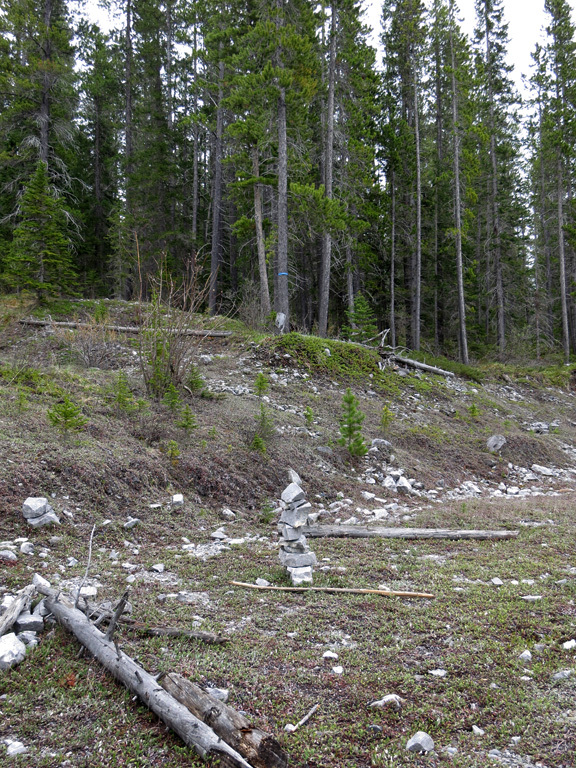 The journey begins at the Goat Creek parking area, which can be reached by following the Spray Lakes Road southwest from the Town of Canmore for 8.6km; first, past the Grassi Lakes and the Nordic Centre; and second, past the hydroelectric dam after a steep climb on a gravel road. There are a couple parking areas next to a small lake, but the one you want is a third located at the bottom of a hill that has washroom facilities. From the parking area, cross the road and walk up the ramp at the foot of Ha-Ling Peak, and then cross the bridge which spans a canal. On the other side of the canal, ignore the Ha-Ling trailhead to your left and start walking southward along the canal. From this point, the trailhead for Mt. Lawrence Grassi is approximately 2.1km away and will take about 20 minutes to reach at a decent walking pace. You'll eventually find the trailhead to your left, marked with both a cairn and some blue flagging. A brief section of relaxed forest trail will bring you to one of the main drainages for Grassi; where after walking among the rocks for a hundred metres or so, you'll soon return to the forest as an obvious trail heads upwards, towards the ascent ridge on the left of the drainage. The climbing from this point onwards is pretty steep, as you'll be gaining a kilometre of elevation over an approximate horizontal distance of 3.5 kilometres, for an average grade of around 30%. If you weren't warmed up at the beginning, you certainly will be by the time you top out of the treeline as the ascent's a definite workout. I encountered some deadfall along the trail, but nothing that wasn't easily detoured. Once above the treeline the route is obvious. Continue heading upwards along the ridge, following the faint bits of trail that switch back and forth. The ridge will narrow as you gain altitude, with some exposure to the sides, but the majority of this can be avoided by sticking near the centre. Due to a combination of smooth slabs and a lot of loose crap, finding good footholds over the last hundred metres to the summit can be difficult and slippery, even in dry conditions. You may find many steps will require you to use a combination of friction and pressure to propel yourself forward; an approach that works better when done aggressively. Before you know it, you'll be at the summit. Simply retrace your steps for the descent, but be sure to exercise considerable care on the way down over the loose rock; particularly for those first few hundred metres. Mt. Lawrence Grassi should not be attempted as a winter ascent. Those last few hundred metres to the summit can be slippery even under dry conditions due to smooth slabs with a lot of small, loose debris. Add a layer of snow, and you have the very real potential for an uncontrollable, dangerous slide. Depending on the time of year, there can be a cornice (as seen in some of my photos) on the north-facing side of the summit which may obstruct the view of Canmore. I would expect it to be gone by July in most years. The ascent of Mt. Lawrence Grassi is also described in Alan Kane's Scrambles in the Canadian Rockies. 2,685 m / 8,809 ft.
1,657 m / 5,436 ft.
1,028 m / 3,373 ft.
396 m / 1,299 ft. Although this route was recorded with a GPS unit, this data should only be used as a SECONDARY navigation tool. Be sure to read this important disclaimer before attempting this trip or others profiled by this website.